We just tested two samples of Evetar N123B05425W lens that is very similar to Sunex DSL945D described in the previous post. Both lenses are specified to work with 10 megapixel sensors, so it is possible to compare “apples to apples”. 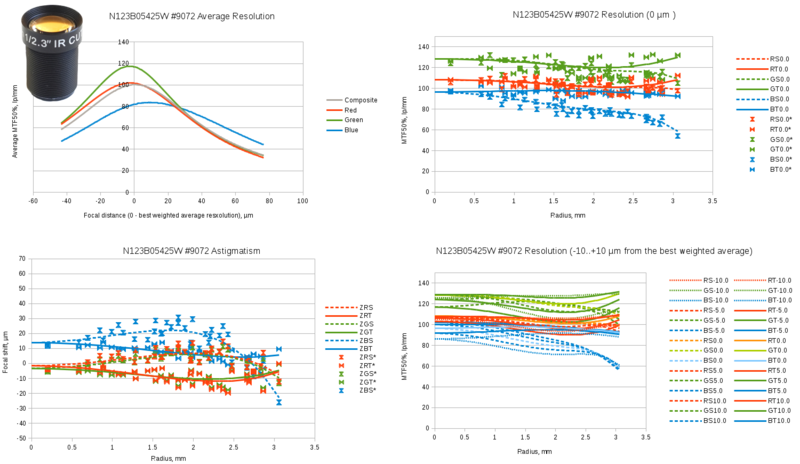 This performance comparison is based only on our testing procedure and does not involve any additional data from the lens manufacturers, the lens samples were randomly selected from the purchased devices. Different applications require different features (or combination of features) of the lens, and both lenses have their advantages with respect to the other. 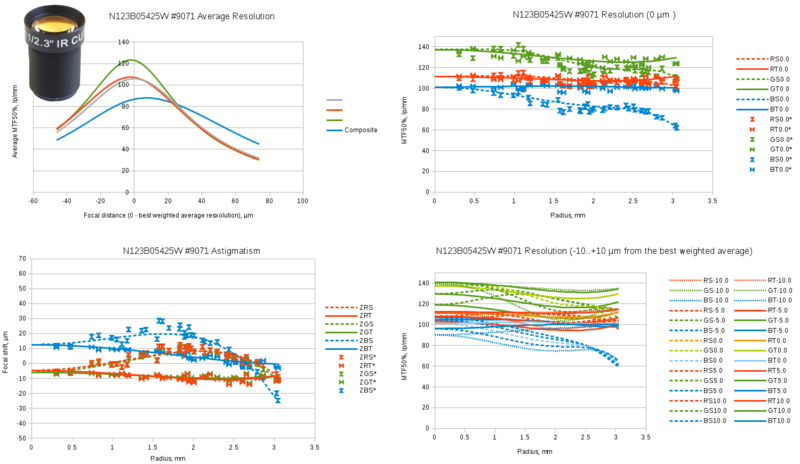 Sunex lens has very low longitudinal chromatic aberration (~5μm) as indicated on “Astigmatism” (bottom left) graphs, it is well corrected so both red and blue curves are on the same side of the green one. Evetar lens have very small difference between red and green, but blue is more than 15 μm off. My guess is that the factory tried to make the lens that can work in “day/night” applications and optimized design for visible and infrared spectrum simultaneously. Sacrificing infrared (it anyway has no value in high resolution visible light applications) at the design stage could improve performance of this already very good product. Petzval field curvature of the DSL945D is slightly better than that of the N123B05425W, astigmatism (difference between the sagittal and the tangential focal shift for the same color) is almost the same with maximum of 18 μm at ~2 mm from the image center. Center resolution (mtf50% is shown) of the DSL945D is higher for each color, but only in the center. It drops for peripheral areas much quicker than the resolution of the N123B05425W does. 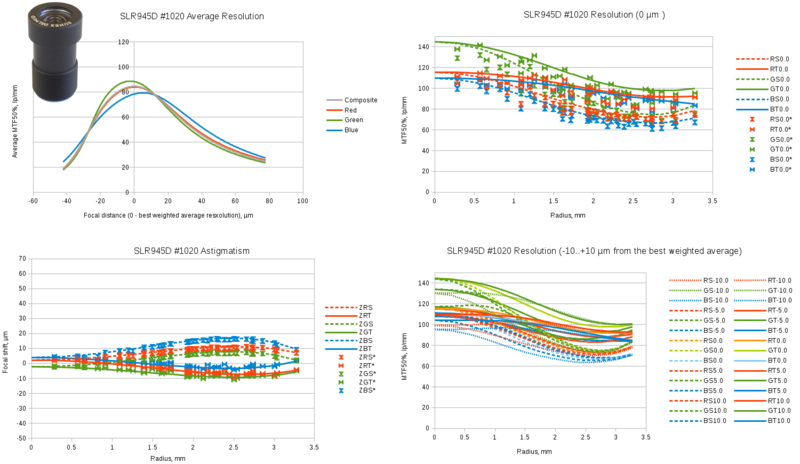 Evetar lens has only sagittal (radial) resolution for blue component dropping below 100 lp/mm according to our measurements, and that gives this lens higher full-field weighted resolution values (top left plot on each figure). The graphs below and the testing procedure are described in the previous post. Solid lines correspond to the tangential and dashed – to the sagittal components for the radial aberration model, point marks account for the measured parameter variations in the different parts of the lenses at the same distance from the center. Fig.1 Sunex SLR945D sample #1020 test results. Spreadsheet link. Fig.2 Evetar N123B05425W sample #9071 test results. Spreadsheet link. Fig.3 Evetar N123B05425W sample #9072 test results. Spreadsheet link. thank you for the kind information. I looking for small form factor camera module (i.e. 12 mm W and H (diameter) and 15 mm L). I need it to be with 120 degree HFOV. I saw some M8 lenses but didn’t found any with the wide angle required. Hello Tom, I never used any M8 lenses, we use M12 and a looking to use even larger M14 ones. You requirement of 120HFOV is incomplete until you specify image format (or sensor size). Sunex has a large variety of lenses they offer, so I would recommend starting your search from there. Did you test the transmittance of the Evetar lens in any way? We seem to be getting about 2/3 of the light through the N123B05425 than we get through the DSL945 (both without IR cut). This makes me think either Sunex uses lower loss optical material than Evetar or the aperture of the two lenses is actually different. Our measurements are consistent with yours regarding sharpness of our samples, but the illumination difference is perplexing. We did not measure the transmittance of these lenses, well try that. We have implemented such measurements for the complete cameras (to implement vignetting correction), but it is not included in our standard lens testing procedure. The main purpose of such testing is to select the best lenses in a batch (and discard the bad ones), and transmittance does not vary much between the individual samples. What do you do with the failed lenses? I hope you are able to return them for a refund! If not, maybe you could make them available as a product, clearly marked as “failed testing”, for those of us who want to experiment. Andrey, Thanks for your kind information. I wonder why the pictures posted in the passage show the data of Sunex SLR945D, but the passage is talking about Sunex DSL945D? Issac, I’ll try to find – where did the name SLR945D come from, it is probably an error that I was copying multiple times. The lens we tested (and it is visible on the picture) was DSL945D, so all the data there is for this lens.